about this year's "Simply Marble-ous" Treasure Hunt. and a special thanks to our friends and partners at JetBlue Airways! Five treasure hunters from Greater Boston had something special to celebrate this Thanksgiving, as Save the Harbor / Save the Bay announced the winners of their "Simply Marble-ous" Treasure Hunt, sponsored by JetBlue Airways. 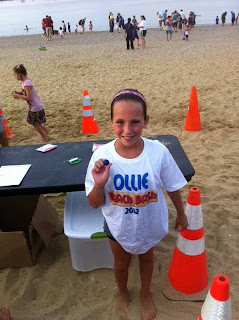 Bridget of South Boston shows off her marble! 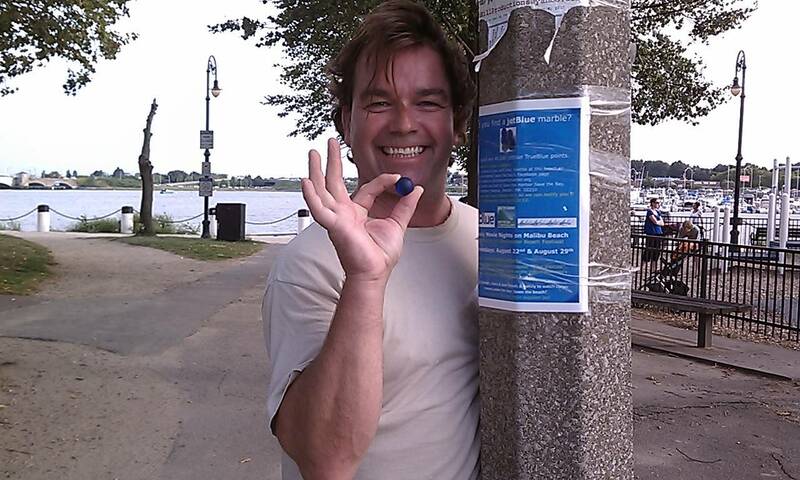 More than 1,000 people took part in the treasure hunt, including participants from Chelsea, Dorchester, East Boston, Hull, Lawrence, Lynn, Melrose, Milton, Nahant, Peabody, Quincy, Reading, Revere, Somerville, South Boston, Stoughton and Winthrop. 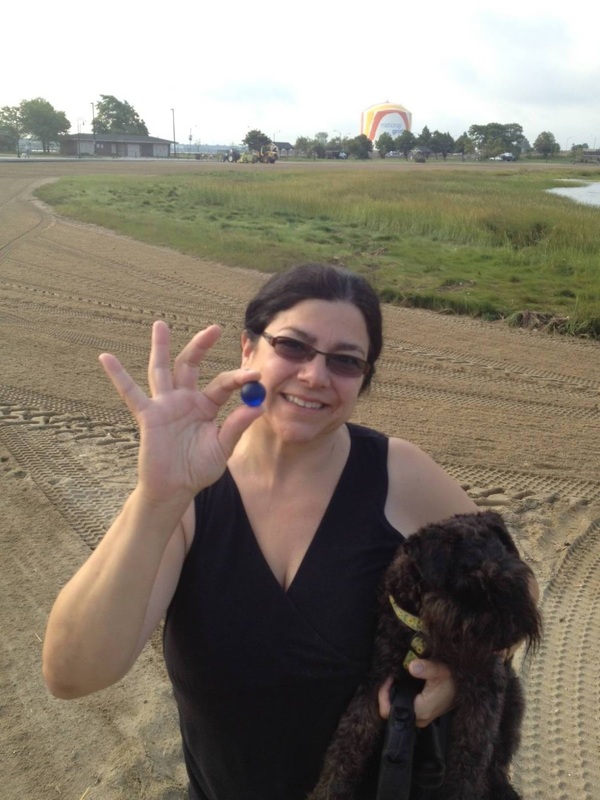 The five lucky winners were chosen from the more than 100 beachcombers who found a cobalt blue marble on one of the Boston Harbor region's public beaches. 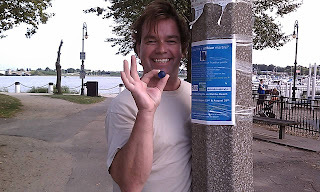 Each received 40,000 TrueBlue points that can be redeemed for flights to any of the 45 nonstop destinations JetBlue serves from Boston’s Logan International Airport. found his marble on Malibu Beach. Susan and Vanya of Dorchester share their marble! Caitlin proudly displays her discovery! 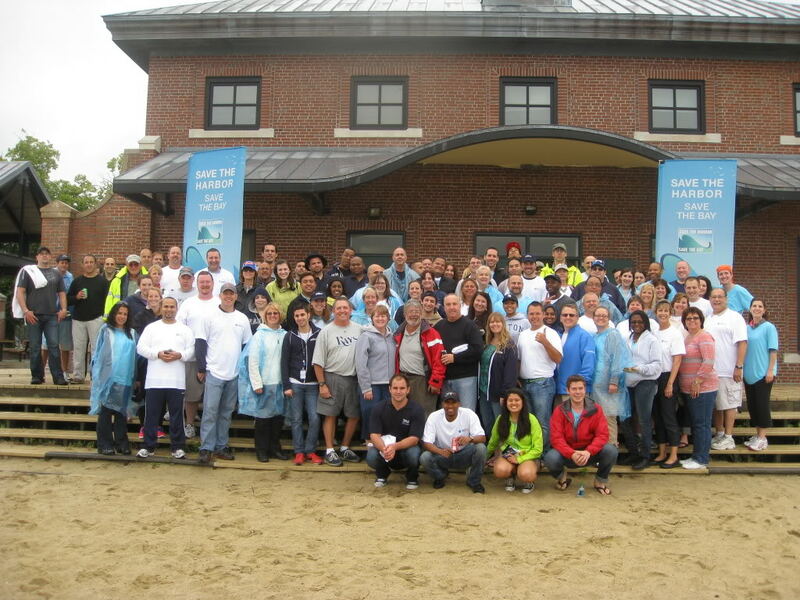 The "Simply Marble-ous" Treasure Hunt began in June when 100 JetBlue crewmembers and volunteers from Save the Harbor hit the beach in South Boston for an early season cleanup. Working in teams, they helped the Department of Conservation and Recreation remove trash, weeds, stray sand and debris from Carson Beach. Michael with his totally marble-ous find! on the region’s public beaches in Nahant, Lynn, Revere, Winthrop, East Boston, South Boston, Dorchester, Quincy and Hull. 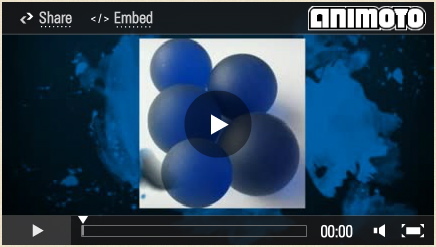 The one-inch tempered blue glass marbles were both beautiful and environmentally friendly. They are made of recycled glass, which was made from sand. 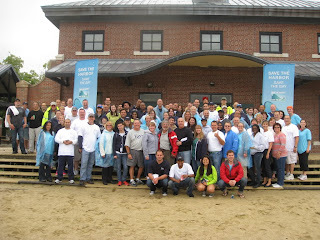 More than 100 JetBlue employees gather with Save the Harbor staff before starting the beach cleanup and kicking off the "Simply Marble-ous" contest in June! "We really want to thank JetBlue Airways for giving something special back to our community," said Save the Harbor's spokesman Bruce Berman. "They are great partners, and we really treasure their support." Hello friends, Mike Murowchick here once more! As Save the Harbor's photographer and videographer, it was my pleasure to be able to attend our free fall cruise to Spectacle Island on Saturday, October 27. On the return trip back to Boston, I interviewed Linda Grenfell of Dorchester. 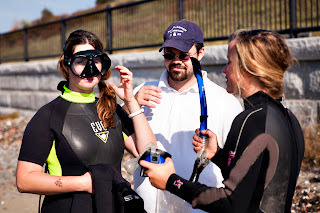 This was her first time accompanying Save the Harbor on one of our free cruises and she had a blast! She loves what Boston Harbor has to offer to people of all ages, and believes the Harbor is one of nature's gifts that we should not take for granted. 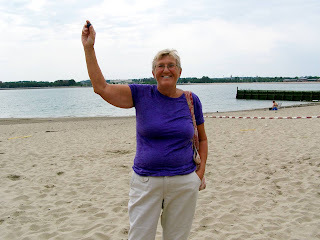 While many of the visitors spent the day relaxing on top of the north and south drumlins or treasure hunting down on the beach, Linda spent her day navigating the island in search of signs of animal life. It is said that deer and turkeys call Spectacle Island home, but Linda believes that there might be another species that inhabits the island: coyotes! This is the final installment of a four-part interview series aimed at capturing the many faces and stories of Spectacle Island. The first three parts can be found here, here, and here. More great pictures from today can be found on our photobucket site. Hello friends, Save the Harbor's photographer/videographer Mike Murowchick here again! On Saturday, October 27th, over 400 people registered to join us on our final cruise to Spectacle Island of the season. This is the 3rd installment of a four-part series of short interviews aimed at capturing the many faces and stories of Spectacle Island. Parts 1 and 2 can be found here and here. In the afternoon, the tides finally began to recede, exposing the beach and countless pieces of sea glass and other historic artifacts. Dozens of eager treasure hunters flocked to the beach to see what they could uncover. 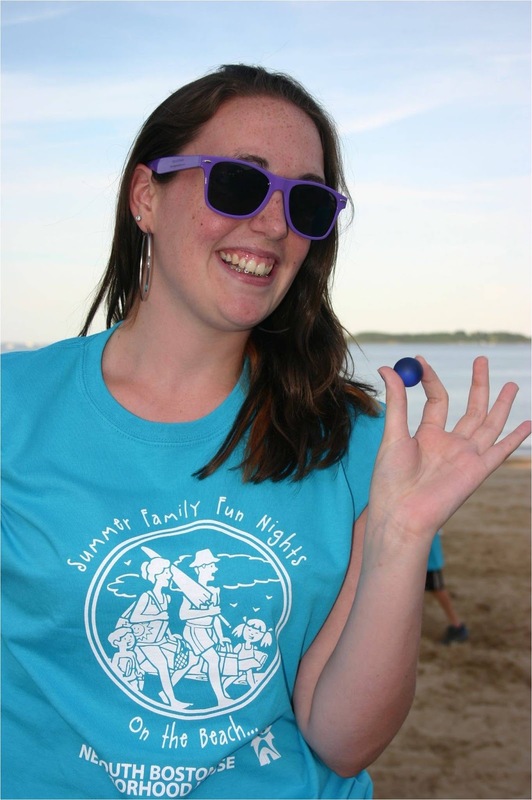 Common finds usually include sea glass of all colors, pottery, and fine china, and rarer items include marbles. However, today we found something none of us had ever found here before. At first we thought it might be a porcelain ventriloquist doll's head, but upon further investigation we learned it was actually a top piece of a circus cane, long-detached from its wooden shaft. To see what it looks like, check out the video! Hello friends, Mike Murowchick here again! As Save the Harbor's photographer and videographer, it was my pleasure to be able to attend our free fall cruise to Spectacle Island on Saturday, October 27. Once the tide started to recede in the afternoon, visitors took to the beach in search of Spectacle's wonderful assortment of historic artifacts. Among the group of treasure hunters was our very own David Coffin, a maritime historian who works with the Save the Harbor summer programs. He is a frequent visitor to Spectacle and loves to dive right into the water - even in late October when the waters are frigid! 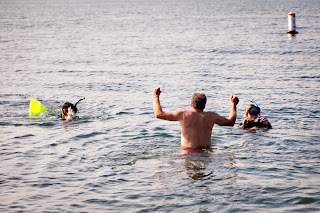 Bruce Berman, Save the Harbor's Director of Communications, and I interviewed David after his dip into the chilly waters off Spectacle. 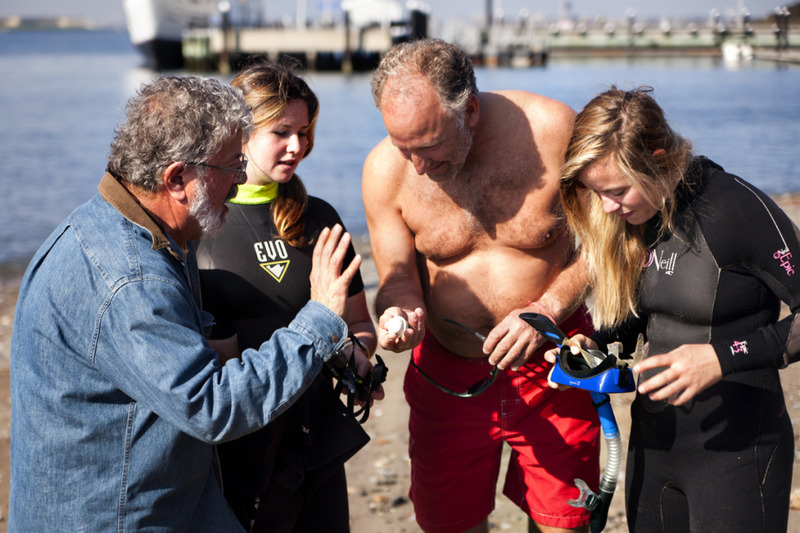 While he loves to uncover rare artifacts on the beach, he takes even greater joy in interacting with kids and trying to see if they can identify artifacts that have been on the island decades before they were even born. Unfortunately, while Spectacle Island is "right in their backyard," many of the kids do not get a chance to visit Harbor Islands as frequently as the should, or even at all, and David believes it would greatly benefit the kids if the islands were more accessible year round. This is part 2 of a four-part interview series aimed at capturing the many faces and stories of Spectacle Island. Part 1 can be found here. Hello friends, Mike Murowchick here! As Save the Harbor's photographer and videographer, it was my pleasure to be able to attend our second free fall cruise to Spectacle Island on Saturday, October 27. Despite the approach of Hurricane Sandy, the weather more than cooperated and we were able to enjoy a wonderful fall day. Once the tide started to recede in the afternoon, visitors took to the beach in search of Spectacle's wonderful assortment of historic artifacts. Among the group of treasure hunters were Laura Fawcett and her friend Barbara Krasinski. 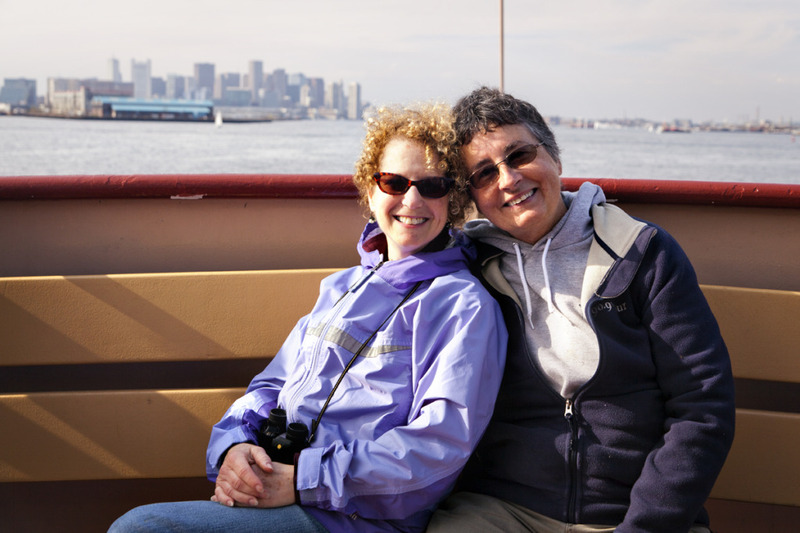 Laura used to work for Save the Harbor as a Senior Marine Educator, and upon hearing about the fall cruise decided it would be a great opportunity to invite her friend Barbara out for a trip to Spectacle. The two self-titled "Harbor Hunnies" are both experienced snorkelers and seized the opportunity to put their wetsuits to the test. 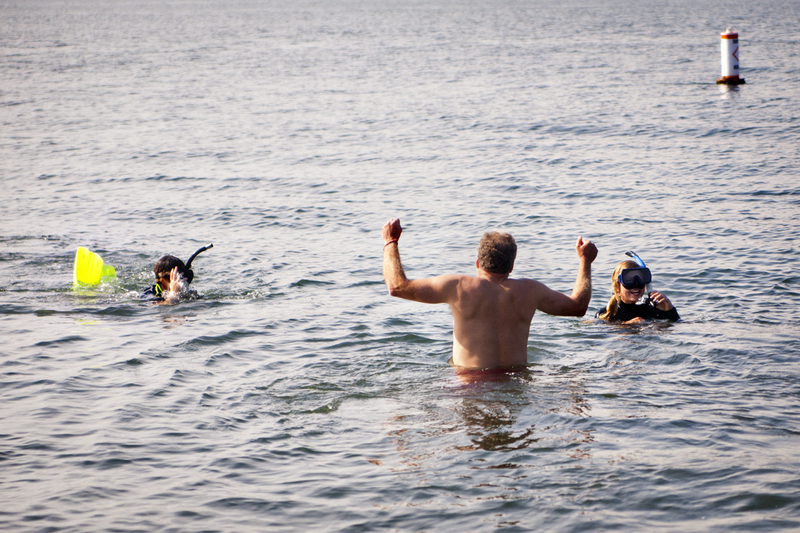 They dove right into the frigid harbor waters and immediately began their treasure hunt for submerged artifacts. After returning to the beach, Bruce Berman, Save the Harbor's Director of Communications, and I interviewed Laura and Barbara about their time on Spectacle and their thoughts on Boston Harbor as a whole. They both had a blast snorkeling off the beach this late in the season, as the Harbor Islands are usually closed this time of year. They both agreed that the season should be extended to allow more people to take advantage of all Spectacle has to offer. More great pictures from the fall cruise can be found on our photobucket site, and be on the lookout for part 2 of my interview series - coming soon! 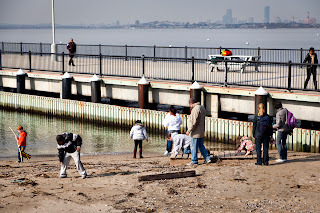 Welcome to Save the Harbor / Save the Bay's Boston Harbor blog "Sea, Sand & Sky". Save the Harbor/Save the Bay is a non-profit public-interest Boston Harbor environmental advocacy organization whose mission is to restore and protect Boston Harbor, Massachusetts Bay, the Boston Harbor Islands, the Boston Harbor region's public beaches, Boston's waterfront and the marine environment and share them with the public, for everyone to enjoy. Since 1986, Save the Harbor / Save the Bay has been the driving force behind the transformation of Boston Harbor from one of the dirtiest urban harbors in America to one of the cleanest in the world. As a result of our advocacy, Boston Harbor has been transformed from a "Harbor of Shame" into a source of recreational, educational and economic opportunity and civic pride. 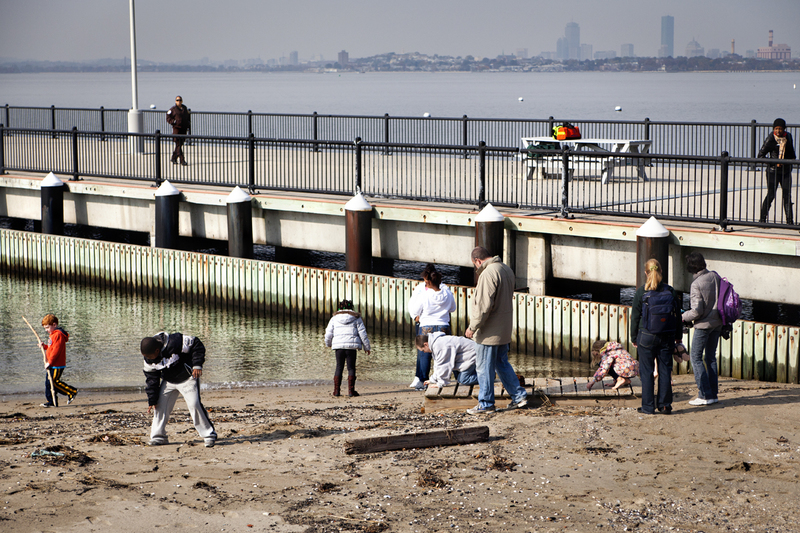 Today the beaches of South Boston are among the cleanest urban beaches in the nation, the Boston Harbor Islands are a National Park, and Boston's waterfront has become a compelling destination for residents and visitors alike. Working with a broad base of civic, corporate, government, scientific, philanthropic and community partners, Save the Harbor / Save the Bay continues to strengthen the connections between communities and the harbor, and promote the increasingly important impact Boston Harbor has on the region’s economy. Each year Save the Harbor / Save the Bay runs 2 free Youth Environmental Education Programs that combine recreation and hands-on education to bring Boston Harbor alive for thousands of Boston area young people. Since 2003, we have connected nearly 250,000 youth and teens to Boston Harbor, the Boston Harbor Islands, our region's public beaches and Boston's waterfront. Our "Boston Harbor Explorers" program serves thousands of young people at the Courageous Sailing Center in Charlestown, the Piers Park Sailing Center and Constitution Beach in East Boston, DCR's Carson Beach in South Boston, at Community Boating on the Charles River, on Black's Creek in Quincy, and at Camp Harbor View on Long Island and at The Boston Children's Museum. Our "All Access Boston Harbor" program departs weekdays from the Blue Hills Bank Pavilion in South Boston, and brings thousands of youth and teens from more than 100 community groups to Georges or Spectacle Island in the Boston Harbor Islands National Park on the Provincetown II. 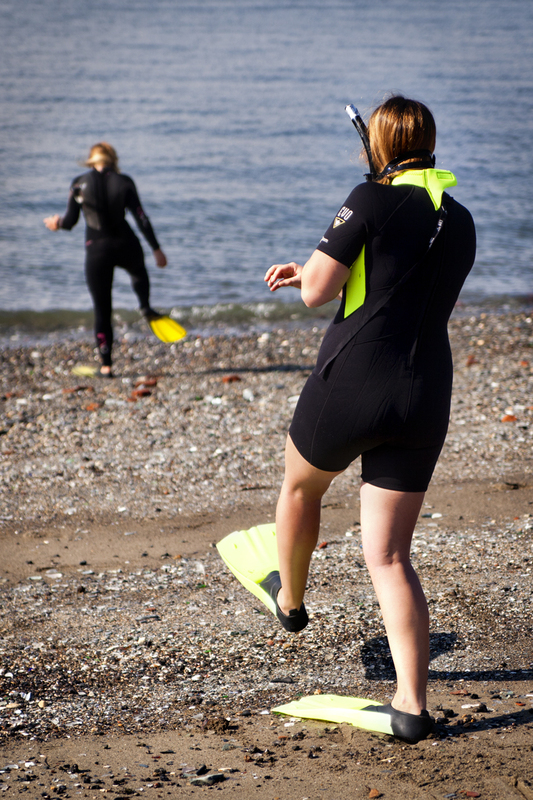 Our Better Beaches Program supports dozens of free events and activities on the region's public beaches each year in Nahant, Lynn, Revere, Winthrop, East Boston, South Boston, Dorchester, Quincy and Hull. We hope we can count on you as we share Boston Harbor with 30,000 young people on 28 free island excursions and at 40 free events and programs on the region's public beaches in 2018. Click on this link to make a contribution today.